Glider is also known as the Lesser Flying Phalanger and the Short-Headed Flying Phalanger. This possum is an arboreal (tree-dwelling) marsupial that lives in forests and rainforests of mainland Australia, Tasmania, New Guinea, and some nearby islands. These social, territorial mammals live in small groups. During the day they rest in hollow trees, in nests that are lined with leaves. This large-eyed mammal is nocturnal; it is most active at night. The sugar glider has a life span of about 14 years. 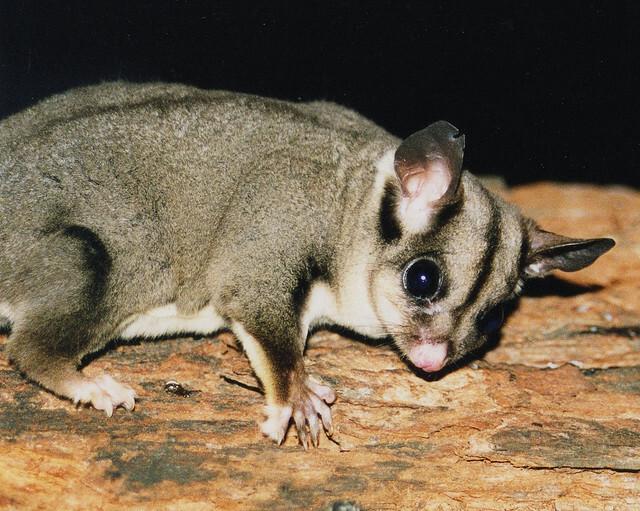 Its scientific name, Petaurus breviceps, means “rope-dancer with a short-head.” Sugar gliders are phalangers, they belong to the family Phalangeridae (long-tailed arboreal marsupials with fox-like ears). The sugar glider is an omnivore (eating plants and animals). It licks sweet gum from the acacia tree, sweet sap from eucalyptus trees, nectar, and some small invertebrates (like insects, larvae, and spiders).